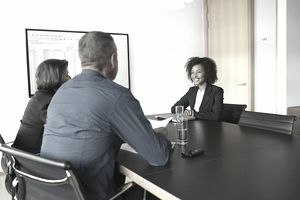 Competency-based interview questions require interviewees to give specific examples of times in which they demonstrated particular skills or attitudes. Often, these types of questions begin with the phrases "Describe a time when..." or "Give me an example of a situation where..."
Generally, these questions require interviewees to describe a problem or situation, the actions they took to handle it, and the end results. They allow the employer to quickly evaluate a candidate's mindset, and gauge how a candidate handles certain situations. Interviewers may ask questions about a variety of competencies depending on the skills required for the specific job. For example, while an interviewer for a retail job may ask competency-based questions about communication and teamwork, an interviewer for an upper management job may ask questions about leadership, independence, and creativity. To prepare for competency-based interview questions, make a list of skills and attitudes that you think are important for the job for which you are interviewing. Check the job listing for examples of required abilities. Next, list situations in which you have demonstrated each of these competencies. For each situation, write down the situation or problem, the actions you took to handle the problem, and the ultimate results. This is a modified version of the STAR interview review response technique. STAR stands for situation, task, action, result. Using this technique will help you give a brief, coherent, and structured response to interview questions. Once you have prepared a list of situations, review it. By thinking of examples before the interview, you will be able to answer questions quickly and concisely. Here are tips on how to answer a competency-based interview question. It is easy to wander when answering a competency-based interview question, particularly if you do not have a specific situation or problem in mind. Before answering the question, think of a specific example of a past situation that answers the question given. Provide a clear, brief description of the situation, explain how you handled the situation, and describe the results. By focusing on one specific example, your answer will be succinct and on topic. If you are describing a particular problem or difficult situation (for example, a time when you had to work with a difficult boss), it may feel natural to attack or place blame on another person. However, these questions are about you, not about anyone else. Focus on what you did to manage the situation; do not dwell on other peoples’ issues or failures. Tell us about the biggest change you have had to deal with in your previous employment. How did you handle it? Tell us about a situation where you failed to communicate appropriately. In hindsight, what would you have done differently? Describe a time when you had to explain something complex to a colleague. What problems did you come across and how did you deal with them? Tell us about a time in which you developed an unconventional approach to solve a problem. How did you develop this new approach? What challenges did you face and how did you address them? Tell us about a decision you made that you knew would be unpopular with certain people. How did you handle the decision-making process? How did you handle other peoples’ negative reactions? Describe a situation in which you changed your approach in the middle of a project. What made you decide to change your approach? How did you work to implement this change smoothly? Describe a situation in which you were asked to perform a task you had never performed previously. Tell us about a time when someone asked you to do something you objected to. How did you handle the situation? Describe a time in which you had to improve a team’s performance. What challenges did you meet and how did you address them? Describe a time in which you received negative feedback from an employer, colleague, or client. How did you manage this feedback? What was the outcome? Describe a time in which members of your team did not get along. How did you handle the situation? Describe a time in which you were a member of a team. How did you positively contribute to the team? Accountability, ambition, approachability, compliance, conflict management, critical thinking, delegation, flexibility, inclusiveness, influencing, initiative, resourcefulness, and risk taking.